If you love music or appreciate well-designed prints on tees, it comes as no surprise that a section of one’s closet may be devoted to band shirts. But true story, more often than not, we find ourselves getting stuck in that tried and tested T-shirt and jeans formula. How, you ask, can we get out of this? This Fashionista shows us one of my favorite solutions — by taking inspiration from the band itself. 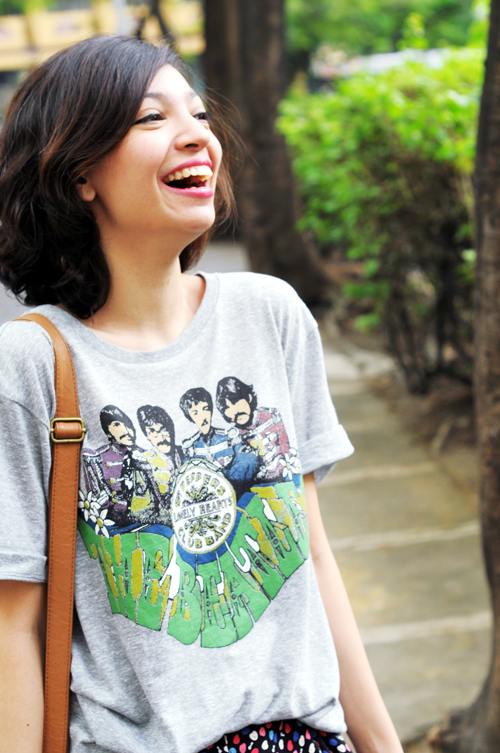 Our Fashionista’s band shirt of the day is that of the Beatles. And when asked what words come to mind when she thinks of the Beatles, our Fashionista mentioned whimsy and love. To add love, she chose a heart printed skirt to pair with her Beatles band shirt. To add whimsy, she chose to wear her pointed gold leather flats. So the next time you find yourself not knowing what to wear with your band shirt (aside from your trusty jeans, that is), take a cue from your chosen band’s personal style or pay homage to one of your favorite songs from that band and dress accordingly. Head to the Nearest Promod!